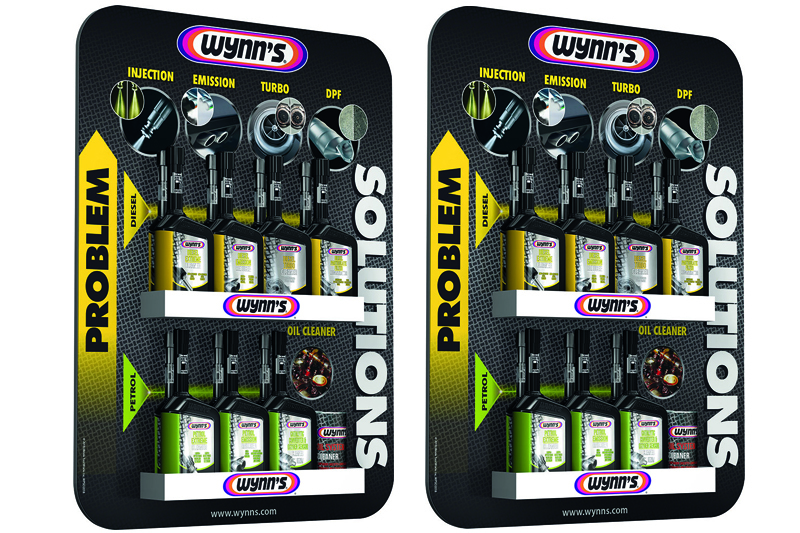 Wynn’s has created a handy new display for the workshop wall, which allows technicians to quickly and easily identify which product will be the best tool for the task at hand. PMM finds out more. Wynn’s is a worldwide company that has been manufacturing engine treatments and solving workshop problems for nearly eighty years. Common engine problems such as blocked diesel particulate filters, high emissions, sticking turbos and blocked injectors are challenging workshop technicians every day, and the company has made it its mission to help. The result is the company’s new Problem and Solution Display, which holds eight products, so that problems can be tackled quickly and efficiently, saving valuable workshop time. The specific role of the DPF, which is used in most modern vehicles, is to trap larger soot particles within the filter in diesel vehicles, allowing smaller particles and gases to escape. Problems can arise when engine contamination prevent clean combustion and subsequently the DPF’s ability to empty or ‘regenerate’, with the filter becoming blocked. Wynn’s recommends Diesel Particulate Filter Regenerator for diesel engines, which can help to clear blocked particulate filters and reduce soot emissions without dismantling. Today’s turbochargers use Variable Vane Technology (VVT)/Variable Geometry Technology (VGT) which alters the flow, directing more or less exhaust gas onto the turbine blades. Altering the flow in this way adjusts the speed of the turbo to suit the needs of the engine. As deposits build up on the vanes of the turbo, this can cause the vanes to stick, affecting the performance of the engine. This can result in loss of/erratic performance, over/under boost, limp home mode, breakdown and expensive repair bills. Sticking variable vanes will result in the engine management light illuminating with a fault code for high or low boost. Wynn’s Turbo Cleaner is a special blend of chemicals developed to clean deposits from the exhaust (turbine) side of the turbo, freeing and restoring efficient operation of the variable vanes without the need to dismantle components. Wynn’s Turbo Cleaner will remove soot build up from the turbo vanes, thus restoring turbocharger operation and restoring performance and response. It is suitable for all diesel engines and bio-diesel to B30, and is compatible with all diesel exhaust gas after treatment devices, including turbo, EGR valve, or oxidation catalyst. Oil is affected by contamination in every vehicle. It is the lifeblood of the vehicle and needs changing, replenishing and renewing. Before replacing the old oil with new, Wynn’s recommends cleaning the oil system. The company’s Oil System Cleaner is an oil soluble supplement, which cleans and protects the oil circulation system, and prevents contamination of fresh oil by residues left behind. For more information about the full range of products available from Wynn’s, click here.